There’s a lot of money in the fitness business. The U.S. market is worth $28 billion, and franchise brands are the hottest, fastest-­growing part of it. So how does one of the hottest brands thrive in one of the hottest markets? Ask Dave Long, CEO of the fitness company and workout craze Orange­theory, which offers some actual fun alongside its members’ healthy pursuit. 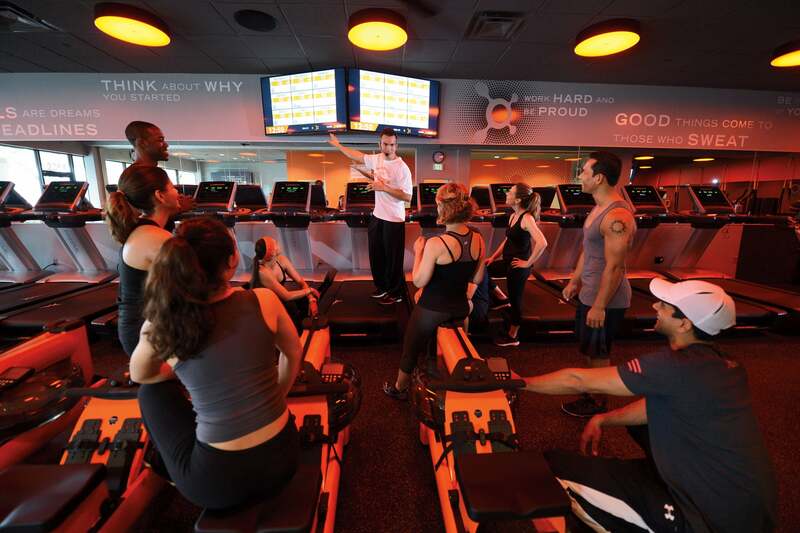 Founded in 2010 and headquartered in Boca Raton, Fla., Orangetheory’s 823 franchise studios have one-hour, trainer-led group classes featuring wrist- or chest-worn heart-rate monitors. Classes aim to help members achieve an “afterburn” effect -- a metabolic sweet spot that sheds calories long after the gym session ends. But Long says that the company’s explosive growth -- including a solid 137 percent increase in revenue over the past three years -- isn’t just about good timing. It’s about doing franchise expansion right. How did you become interested in fitness as a business? I’m a pretty avid extreme-sports type person. I do a lot of snowboarding, surfing and mountain biking. Early in my career I worked at a health club, and later at European Wax Center and Massage Envy. My partner and I were looking for a world-changing fitness product that had already been incubated -- something we thought we could grow and add value to. That’s when we crossed paths with [cofounder] Ellen Latham, who had a large studio with a spinning room, a Pilates room, and an “ultimate workout room,” which was the first version of what Orangetheory does today. At Massage Envy, first as VP of operations and later as a regional developer, you helped to grow the company from 25 locations to 800. What did you learn there that you’re applying to Orangetheory? The entire time there, I worked on developing the pipeline of new franchisees. I learned to be very disciplined and process-oriented. The other part was leveraging momentum -- obviously, when franchisees are doing well, they’re going to want to open more locations, and we want them to, too. How have you been able to expand the Orangetheory brand so quickly? Most of our franchisees now are multi-unit owners, though that wasn’t originally a requirement. If you look at the new franchise trade areas we’re assigning licenses for, 90 percent of them are from existing franchisees who are adding more locations. So that’s your way of retaining growth expertise? Exactly. They have a bigger stake in the business. Some franchise companies do big, multi-unit deals, where franchisees might own 50 to 100 locations. Most of ours will end up owning three to five locations. We found that they’re able to build a tight, successful team to support that without making it too complex. It doesn’t get so big that they can’t get their eyes on and touch and feel the product. That’s sort of the sweet spot we found. Still, you’re about to double the number of studio locations you had from just last year. What kind of guard rails have you put in place to make sure that growth doesn’t become unwieldy? First, we’re very unique in that we run a dual business model. Before the actual workout studio opens, we open up a sort of satellite business with the goal of educating the community and getting them signed up for memberships. Once the studio opens, it’s already busy and people are working out and growing the business by referral. That business runs for a minimum of 12 weeks while the location is under construction. We’ve got a very detailed support plan for how to run that business, and we check in from the headquarters once a week on the metrics. We know where you should be each week. Likewise, we’ve got a very disciplined system once the studio opens; there are milestones and goals to hit each week. We know based on where your studio is geographically and price point and all that, what’s good, what’s great and what’s not so great performance. We do a detailed review after 30 days. And if there are areas for improvement, here’s the action plan to get on track for those areas. If the studio is 100 percent on track, we’ll wait a quarter and do it again. If it’s way off track, within 30 days we come back with a follow-up and make sure things get back on track. All that’s to say, we’ve never had to close a single store. Same-store sales have actually seen almost double- digit growth this year. What makes a good location for an Orangetheory studio? We’ve always been very data-driven. Even when we were smaller, we spent a lot of time analyzing the demographics and psychographics around where we wanted to go. What you have to try to determine is, how many customers do you need to be successful in any given market or location? What’s that person’s age, income and gender? The core of our brand is to make it accessible to all ages and fitness levels, but the largest percentage of our customers are 25- to 49-year-old females with midlevel income. Our ultimate goal is to figure out how to get deeper into those other buckets of consumers, but if you’re talking about opening a new location, we want to make sure we’re lined up with our biggest customer group. Say location A is here on the corner and it’s doing well, and we’re trying to decide if we should open location B three miles away. Because we’ve laid the groundwork for the analytics, we’ll see all the potential customers in that area. And it will show any customers in that area who are already customers of location A, so now you can see the overlap and that there’s still plenty of potential for location B -- or not, for that matter. It’s in black-and-white. If for any reason location B doesn’t end up being successful, we can examine other factors -- not that the location wasn’t set up for success. Where do you see Orangetheory going as a business in the next year? The next decade? Very soon, we’re going to mature domestically and have locations in most areas that can support them. Now we have a huge opportunity internationally. We’re already open in 16 countries. If we end up doing 1,400 locations in the U.S., we believe we can do 5,000 locations outside the U.S. We started very early franchising in Canada, and we have 60 locations there. Next year our big growth markets are Japan, the U.K. and Australia, where we’ll open 25 locations next year. My other long-term goal is, I’ve started to see that a lot of folks who need the Orangetheory product can’t necessarily afford it. So I want to develop relationships with health insurance companies and healthcare providers to subsidize our product for people who really need it. If patients do our workout a couple of times a week, they’re drastically reducing their risk of heart attack and stroke, which are not only serious and life-altering events for the individual but cost insurance providers hundreds of thousands of dollars a year per episode. So there’s a common goal: If we can work together to get more of the population healthier, that’s going to help everybody. How much does this “afterburn effect” play into the sense of community and fierce loyalty you’ve engendered? Or is it mostly a marketing draw?